Having a blast ski touring in November! Colorado. 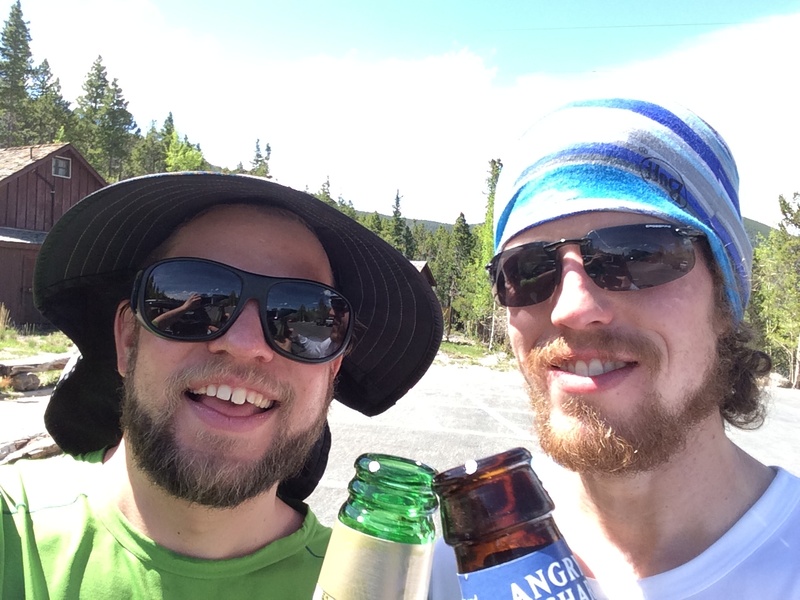 I met up with my friend Mark for another Rocky Mountain National Park mission! 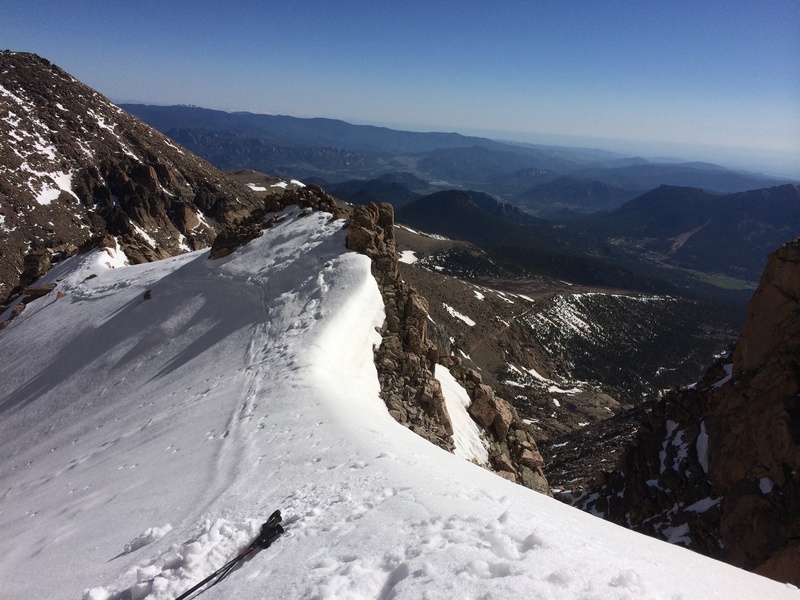 We got an alpine start hiking in total darkness up the Long’s Peak trail towards Chasm Lake and the Long’s diamond where we would find the Lamb’s Slide Couloir. It was a long day filled with obscenely beautiful vistas and adventurous and unexpected happenings. The first car in the parking lot, we knew it would be a great day. We stopped to listen to a stream bubble and check out the stars. We didn’t want to disturb the delicate alpine tundra, but following a trail over snow when footprints go many directions was difficult. Modern technology (gps topo map) brought us back to the trail over and over. We noticed a light mist everywhere for the first several miles, which we later identified as being a cloud. 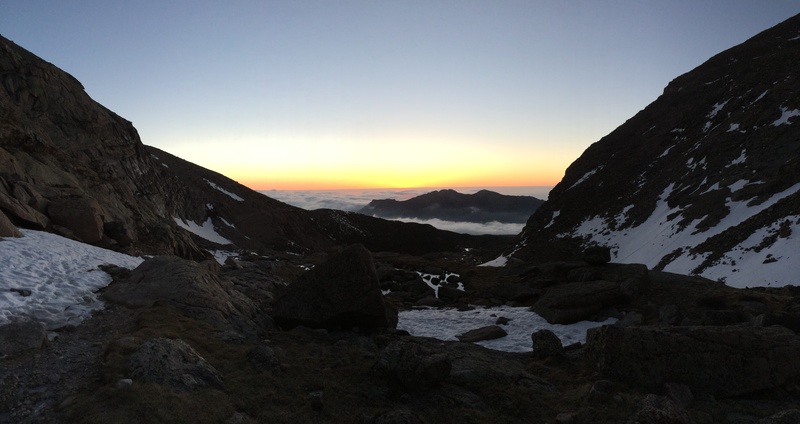 Sunrise showed us a view of Twin Sisters poking through the clouds we had hiked through. 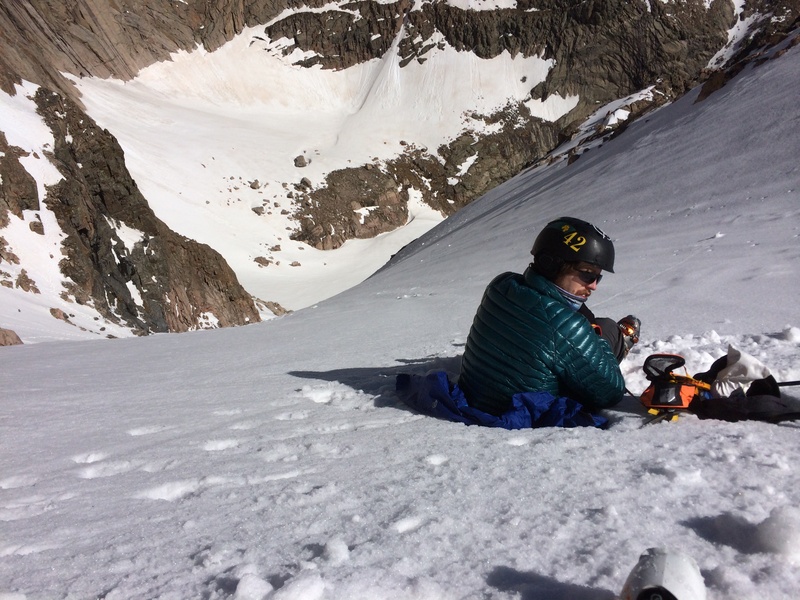 When we finally reached the bottom of Lamb’s Slide, it looked intimidating, but we quickly reached a solid rhythm with our crampons and ice axes. We spent about 40 minutes on top waiting for the snow to turn to corn from ice, but it never did. 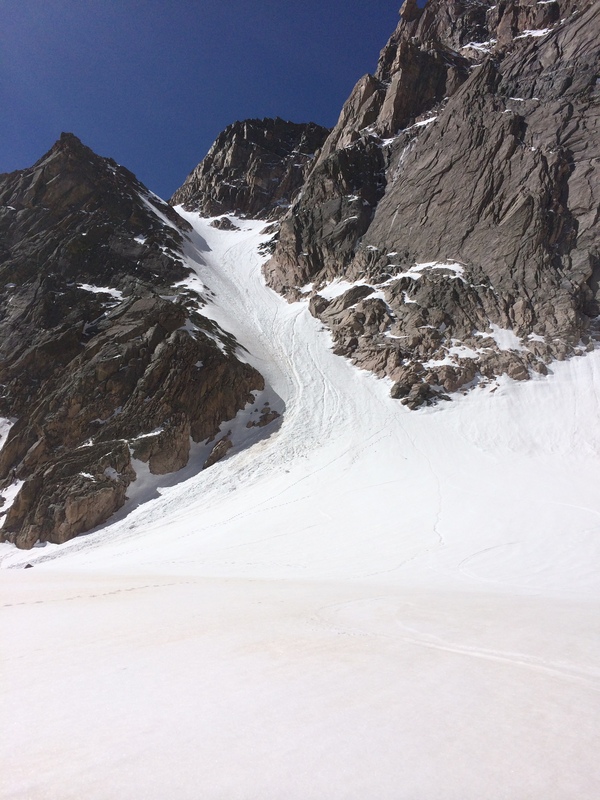 We skied down the crusty 45 degree couloir carefully. Corn snow appeared for the apron and the runout down the small glacier that leads back to Chasm Lake. 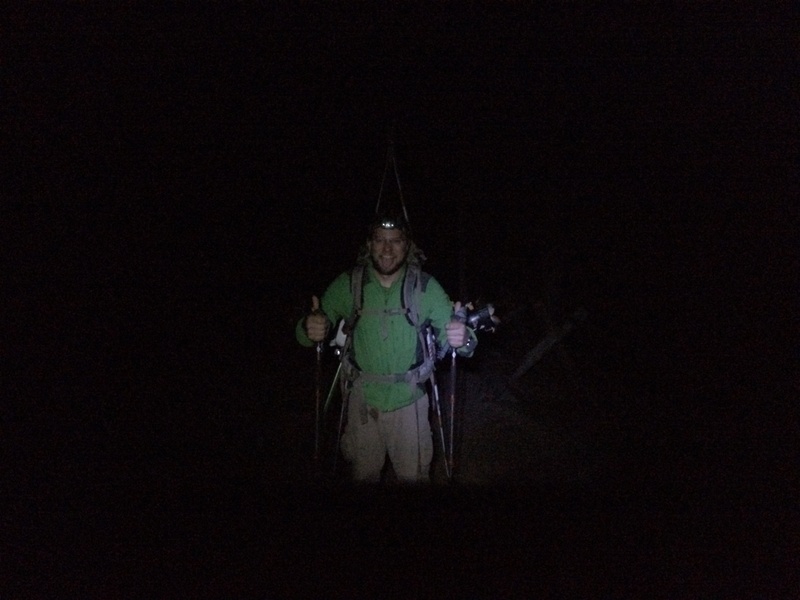 1 super long slog later, we were back in the parking lot with beer, psyched on our successful mission. Lamb’s Slide and the Long’s Peak Diamond! me with Mt. Meeker and Long’s Peak in the background. “The Loft” is in the middle, a ski mission for another day. Thanks to the fine musicians in the Bozeman based bluegrass band “Flatt Cheddar” I was able to meet a fine banjo player and skier named Andrew Schauer. 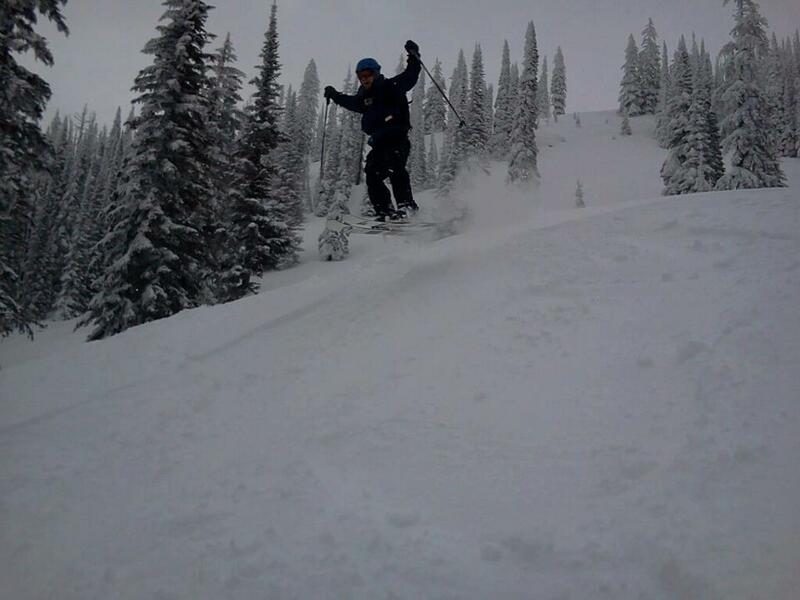 He showed me around a couple of his favorite areas on and near Bridger Bowl after we played tunes the night before. 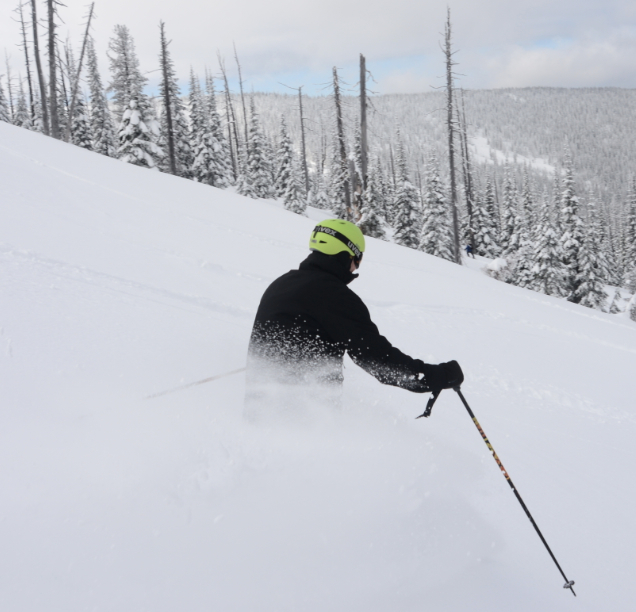 It was a beautiful sunny day that turned into a snowstorm by the time we were skiing down the final zone. 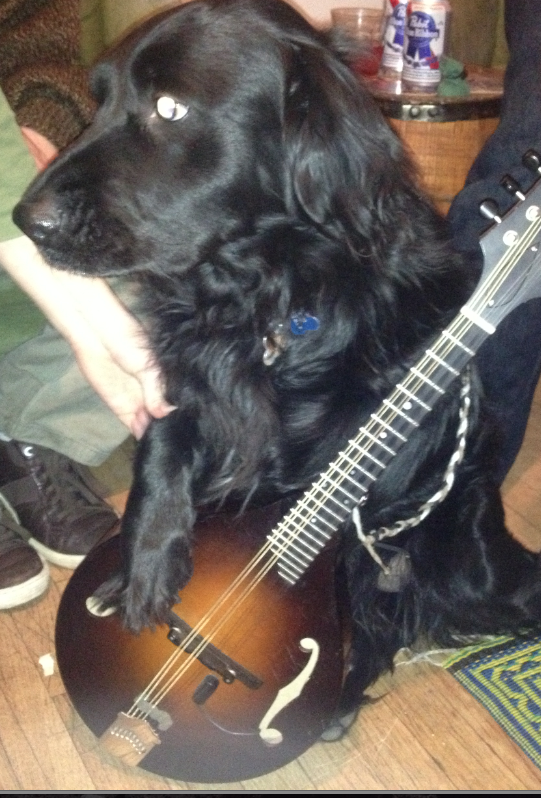 We begin this blog with 2 photos: the first, a dog playing the mandolin. the second, a nice panoramic view from the Bridger Bowl Ridge. 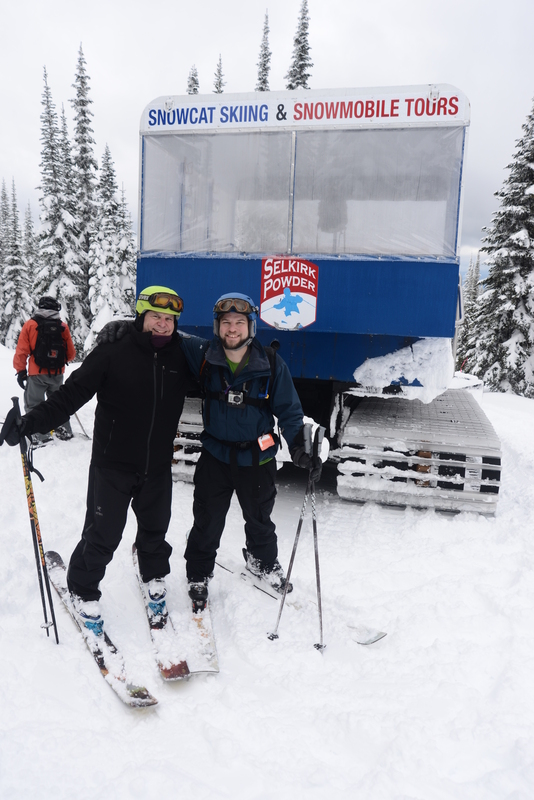 And finally, a video proving that I did go skiing! I dug the music from out of the archives – Blue Moose and the Unbuttoned Zippers collaborating with Fribo at Celtic Connections in Glasgow last year! The amazing guitarist Ewan MacPherson wrote this tune “Soft as Snow on Shore Street.” Ewan, if I got that title wrong, I suppose my Scottish accent interpretation is a wee bit off, and maybe you’re better off with this version? Great tune regardless. 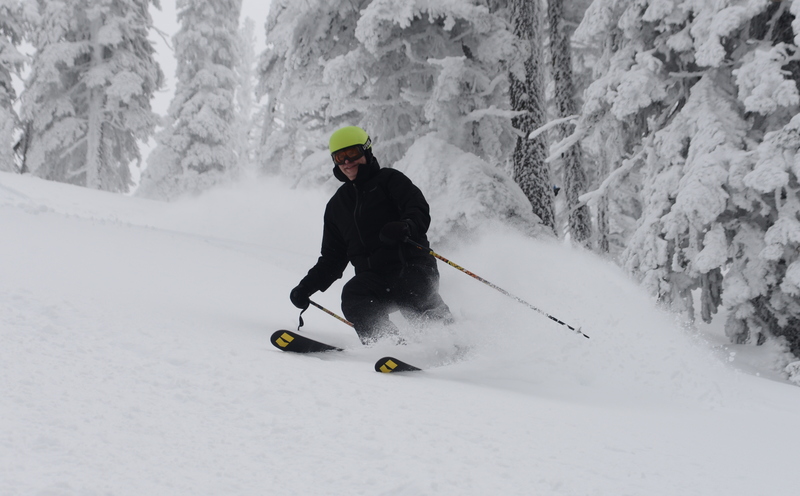 After 2 days of powder skiing at Whitefish, Montana, 1 day of powder skiing at Schweitzer, Idaho, and 1 day of catskiing behind Schweitzer with Selkirk Powder, our magic 4-day long powder spree ended today. My Dad and I awoke today to find 90 percent of the resort closed on wind hold with a base lift going slowly up through crazy gusts, and the snow, sticky mashed potatoes. 3 runs later and we were off to to see my friends Robin and PJ at O’Aces restaurant/bar/casino in DeBorgia, MT. We played some tunes for the folks and ate some delicious food! 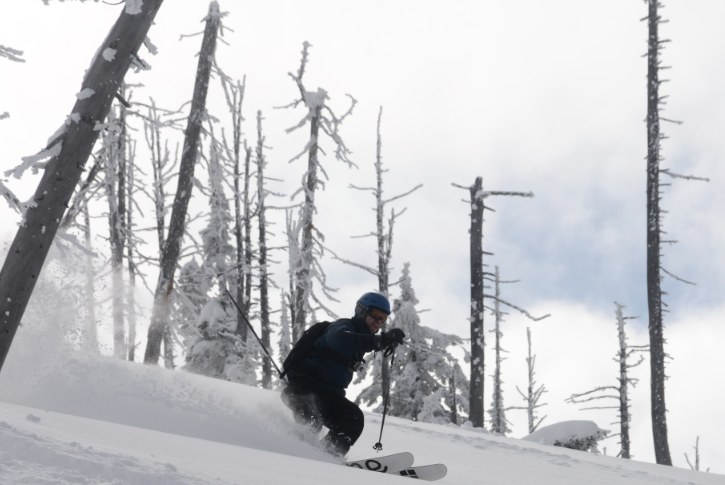 Now we’re looking forward to waking up early to check out Montana Snowbowl in Missoula! 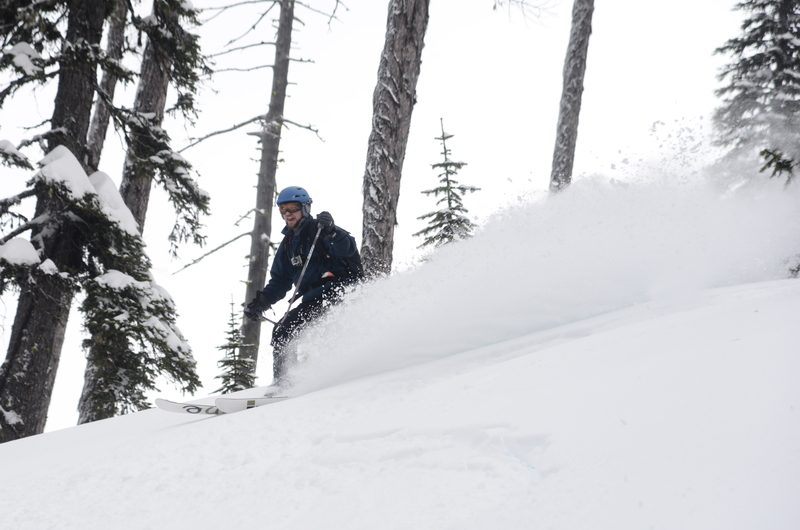 my Dad, Dave Reiner, skiing powder!